Frsky radios are by far the most popular brand in the FPV hobby, they offer great performance at a great price along with an excellent selection of receivers. Just about every buying guide suggests you get a Frsky radio, and I don’t disagree with that. Jumper radios, on the other hand, offer infinite compatibility thanks to their 4in1 radio module. This means you can use just about any receiver with your radio, including FRsky gear. 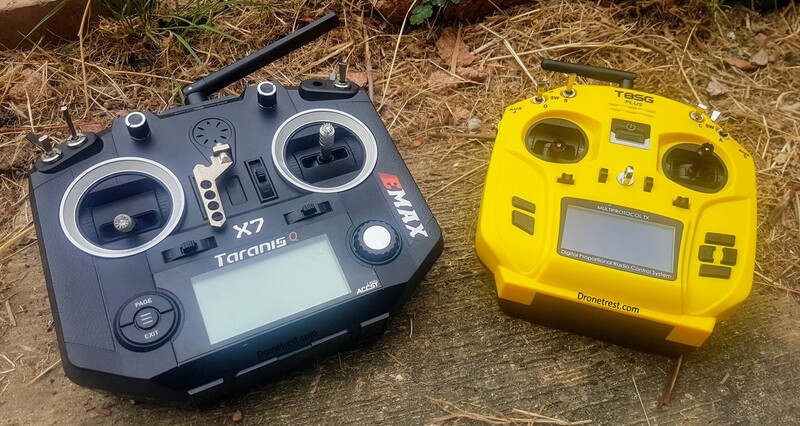 Recently the T8SG has been updated to use significantly better parts so how does it compare to the Taranis QX7? Read on to find out. Both radios are great. The QX7 is still undoubtedly an excellent and safe choice. However, if you value not being locked into the Frsky ecosystem the Jumper radio is definitely something to consider as it is compatible with just about every receiver on the market. But right now it doesn’t have the same massive community behind it. Bottom line, both are great options and both run open source firmware which can only get better in the future. The stand out feature of the jumper radio is the fact that you can use it with just about any receiver on the market thanks to its built-in 4in1 radio module. This includes Frsky (both international and EU versions), Frsky, and Spektrum. And you can also use it with most toy grade quadcopters and FPV simulators via USB. But failing that, the Jumper V2 also includes an external JR style module bay that lets you connect external modules such as the TBS Crossfire long-range radio (with some limitations). So the main reason to get the jumper is to avoid being locked into a single manufacturer set of products. This is something that I love about the radio as I can truly use a single radio to fly every single model I own. The downside of having such flexibility on the jumper is that the menu system of the radio takes some getting used to. Although the interface is fairly easy to understand, there are a set of features specific to each type of receiver you are using which can make it confusing when setting up a new model, particularly for people new to the hobby. There is a fairly detailed manual available along with a bunch of YouTube videos online to help get your started which does help. The small size of this radio can be a good or a bad thing depending on what you want. I like the smaller size as it fits easier into my bag, but I know some people prefer the traditional size of radios as that is what they are used to. I can also agree that the Taranis QX7 is more comfortable to hold than the Jumper Radio. The hall gimbals and OLED screen of the V2 Plus radio make this radio compete with the QX7 S radio in terms of quality and performance. The Jumper is also more affordable than the Taranis. If you want something cheap, you can get the standard version of the jumper that has a smaller screen and regular encoder gimbals. This standard version is cheaper than the equivalent Taranis QX7 that also uses encoder gimbals. 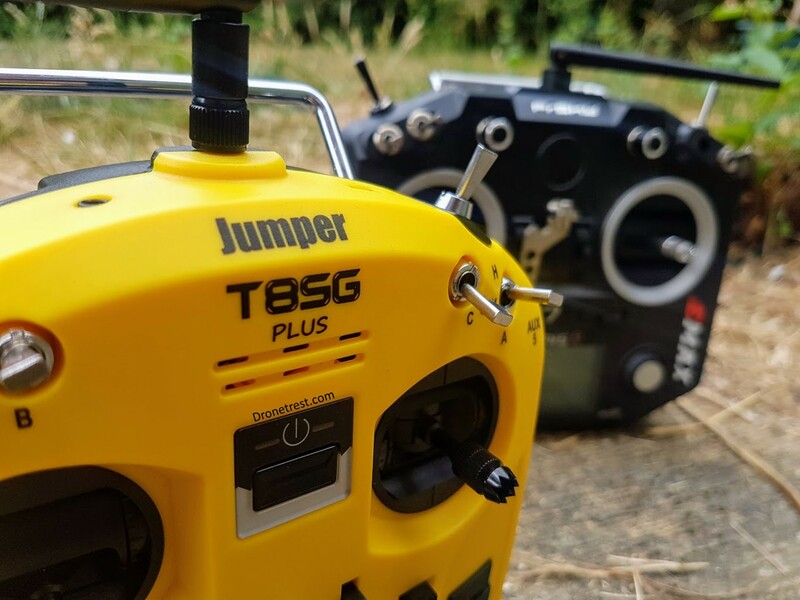 Jumper also offer the T8SG V2 Plus which has a bigger OLED screen and hall gimbals, this puts it closer to the premium Taranis QX7 S radio which also uses hall gimbals, but again the comparable jumper radio is cheaper than the Taranis. Due to the immense popularity of Frsky products in the FPV hobby, everything works with Frsky so you will not be missing out on much if you go for the Taranis. Also because of their popularity, there are infinite videos and guides on the internet showing you how to do just about anything with your radio. But besides this, Frsky is the most popular because they make top-notch hardware at reasonable prices. Although the jumper radio works with nearly everything, being locked into the Frsky ecosystem is not a bad thing as Frsky offer a huge selection of receivers to fit just about any model, from nano drones to ultra-long-range systems. Although both radios use open source firmware, the OpenTX project is more active than the DeviationTX firmware used on the jumper radio. Because of this, you are likely to see the new features sooner on Frsky products before they will trickle down to the Frsky part of the deviation firmware. 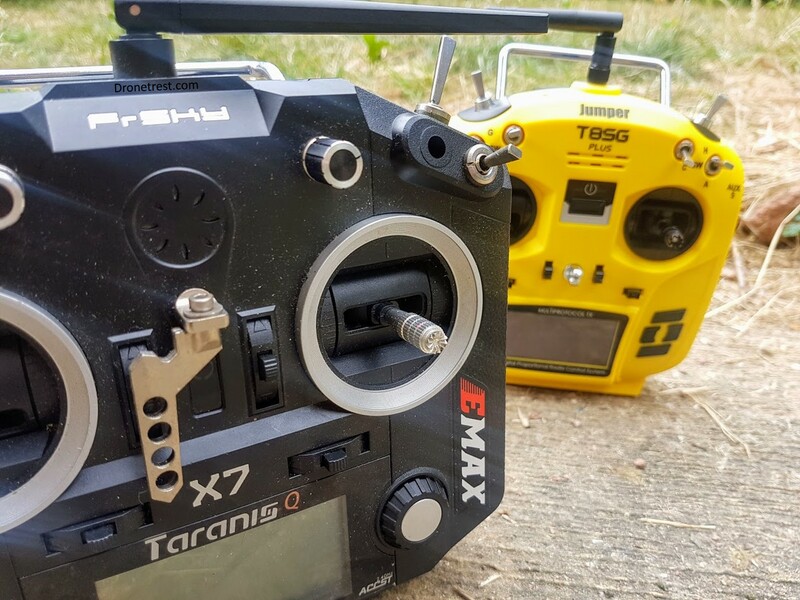 At the end of the day I would say that the Taranis is the safer option to go for, sure it costs slightly more than the equivalent Jumper radio, but the QX7 is an immensely popular radio for a reason. And the Jumper V2 is still a relatively new kid on the block that offers a boatload of features. Like most things that are closely matched, its just a matter of opinion. At the time of me writing this article, I tend to prefer the jumper radio. The reason is that I love the ability to use a single radio to fly multiple models irrespective of the receiver. When you fly a lot of different quads for testing or review purposes, its great to have one radio that you know will work on them all. 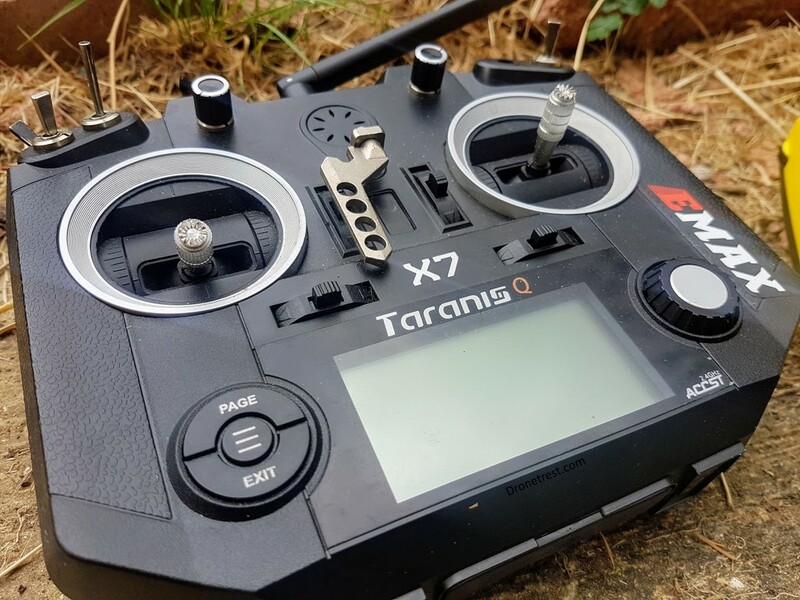 But before I started using the Jumper radio, as you can see, the Taranis QX7 has had loads of use in the last year which is why it does not look very shiny (and is missing a switch). I hope you found this article helpful, if you have some questions, or want to add some information, or simply add your opinion please discuss below. Thanks for reading!